Hey, I'm Steven! I was born and raised in the desert. Good ol' Phoenix, AZ. My musical ambitions were realized early on as a middle-schooler, learning saxophone and piano at school. I began playing guitar on a three string classical I found buried in my closet. I dug it out the summer after eighth grade, most likely out of shear boredom, and almost immediately became determined to learn the instrument. Throughout high-school I would spend more time than anything else playing, practicing and dreaming about creating music and playing my guitar. I began to perform at school talent shows, restaurants and coffee shops, open mic-nights and blues jams. I would fly solo or play with the garage band I formed with a few school friends. The band was called "Red House", named after a Jimi Hendrix song. We would cover blues and rock n' roll songs. My journey into recording/producing began the summer a friend lent me his Fostex 8-track digital recorder. It came with two condenser microphones, a CD burner and headphones. I remember spending hours upon hours recording and overdubbing tracks. It was during this time when I began to further explore songwriting. If I was going to borrow a digital recorder, I needed songs to record. My three sisters soon became the backboard to all of my song ideas. I would write something down and bust into their room with my guitar, eager to share and willing to interrupt absolutely anything in my efforts. Lucky for me, I never got discouraged in the process of writing. I never realized just how terrible those songs were. I was constantly finding excitement in the small victories and discoveries in sound that I was making along the way. As I reached my senior year of high-school, it was time to start thinking about college. At this point, I was undoubtedly convinced that music would be my only path going forward. It was either going to be a music school or no school. Little did I know, I would soon find myself becoming quite burned out and feeling somewhat purposeless. I was struggling with gripping anxiety during these years. It was the kind of anxiety that would shake me to my core and keep me from sleep at night. I began coping with destructive things that would only serve as temporary distraction. I was searching for true deliverance. That's when I found Jesus. My uncle gifted me a bible and the day I decided to open it, I realized that it was much more approachable and way less intimidating than I had assumed. Galatians was the first book I read fully from beginning to end. I was hooked. While reading on the roof of my house, I looked into the sky and saw a large cloud in the perfect shape of a "G". I felt strongly in that moment that God was with me and ready to take on my burdens. As high-school came to an end, I felt the Lord directing my path away from college. I didn't know what was ahead. Within a month I overheard an announcement for worship-team auditions at my church. Up until that point, I had been that kid who would sit in the church service and nod out during the music. I never understood it and it was of no interest to me. God was about to show me what I was missing. As I began to volunteer and gain community around the worship team, my passion and perspective for music began to re-ignite within me. Only this time taking on new purpose. With each new week, I was learning more about what this concept of "worship" really meant and what it required of me. I began to dream up ways in which I could use my musical gifting to praise Jesus and lead other people to do the same. Over the last seven years, I have walked through many unexpected seasons in life but, one thing has stayed the same; my passion for writing and creating music that leads people into an encounter with the one true God. I spent many years searching for vision for my music, always asking myself what would be next and where I was headed. Over the last year, with the fruition of LOVKN, I have felt the Lord give more clear vision and calling than at any other point in my journey. I plan on continuing on in this LOVKN journey and releasing more music. All for the glory of God because His worthiness of praise is never conditional to the seasons of life we find ourselves. Hobby: Breakdancing. Just kidding. But, actually. Not serious. When did you come to Christ? I grew up in a Christian family but was re-baptized and committed at 18. What instruments do you play? Guitar (acoustic, electric), Bass, Piano, Voice, Mandolin, most stringed instruments. Favorite movie: The Blues Brothers, hands down. Interesting fact: I have a twin sister. 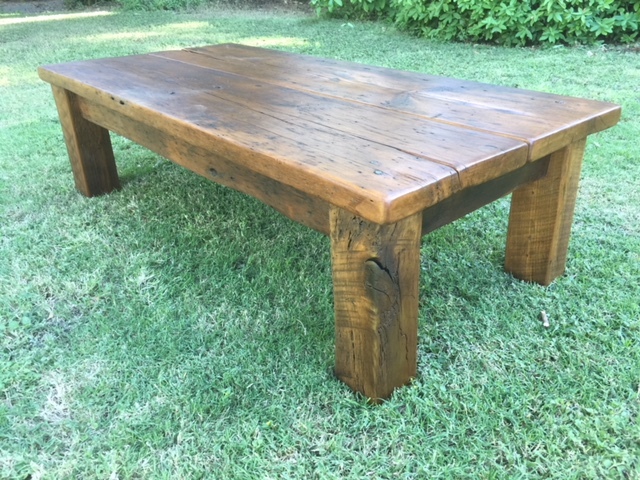 A coffee table I crafted with my bare hands.